There’s so much to do in Aix and across the region – here are some past posts with ideas for outings. Here’s a lovely thing to do on a sunny day – très insolite as the French would say. To paint his beloved mountain, Cézanne used to leave his studio at Les Lauves and go up a nearby hill to set up his easel and start work. It’s quite easy now to follow in his footsteps and share the wonderful view. The hillside has been landscaped so you climb up honey-coloured stone steps, through gardens of lavender, rosemary and oleander. At the top, there is a paved viewing area with 9 panels showing different versions of the mountain completed 1902-1906. Today these are in Basel (2), Zurich (2), NY, Philadelphia, Princeton, Moscow and Kansas City….but we can enjoy the reproductions and of course we have THAT VIEW! It’s a tranquil spot – we were alone there when we visited yesterday – and amazingly there are no modern buildings to spoil the vista that Cézanne loved to paint. To find it, follow the Avenue Paul Cézanne right to the top of the hill. Look out for these signs which point out the stone steps leading to the park. There is no parking so you have to find somewhere nearby. It’s served by the no 5 bus-stop = Les Peintres. I read a tweet last week about a new Statue of Liberty which had been unveiled in Nice and this reminded me that there is one much closer to home. And although ours is nothing like as large as the original in NYC, it is covered with gold-leaf which makes it shine in the Provencal sun. 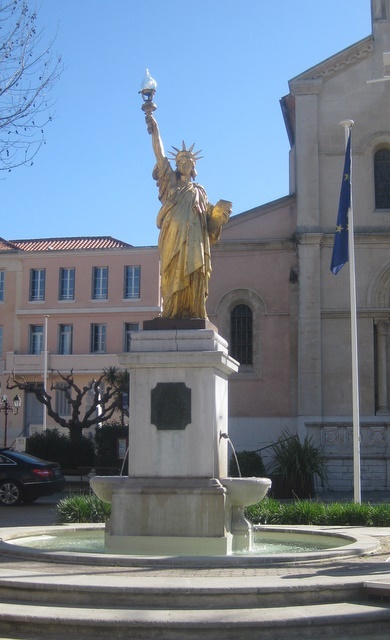 The Statue of Liberty copy was donated to the town of St Cyr-Sur-Mer by the sculptor of the original, Frédéric Bartholdi, and it stands proudly in Place Portalis, the town square, looking towards all the diners on the café terraces. Besides going to see the statue, St Cyr is a good seaside resort to visit now that the weather is so warm. Although it doesn’t have the pretty charm of Bandol or Sanary, it’s one of the few places along the coast where you can have a good long flat walk. The bay has a wide promenade, ideal for jogging or walking with pushchairs. If you head off to the west, you pass through the little port of Les Lecques. You can then climb up on to the harbour wall and walk out along the jetty for good views of the sea and the coast. In the other direction, you come to another small port, La Madrague; here, energetic visitors can pick up the rocky footpath – sentier littoral – across the headland leading to the Calanque d’Alon. The beach is partly sandy, partly pebbly, but there are shells and bits of sea-glass to collect. It’s ideal for family picnics; alternatively, there are lots of little restaurants and bars – we’ve eaten in a few and they offer reasonably-priced drinks and lunches. In Les Lecques, close to the sea-front, there is a Tourist Information office whose staff are extremely helpful with maps and suggestions. They always have an exhibition of a local artist too. Open Mon-Sat 9-17:00, Sun 10-13 15-18:00hrs. Lots of car-parks, free until Easter. http://www.saintcyrsurmer.com/en/contact.asp. It’s about a half hour drive from Aix and a nice outing! Important Note: In September we witnessed a distressing incident where a woman was pulled unconscious from the sea. Although a fellow bather did cardiac massage and the pompiers arrived fairly quickly, it appeared that she couldn’t be saved. And our waiter told us that this was the third incident that morning although the other two bathers had survived. The sea looks so inviting but there must be dangerous currents. The resort does have life-guards but only during the school holidays. Perhaps it’s safer just to enjoy the beach? … how the other half lived! Imagine having so much money that you could travel around Europe buying anything that took your fancy. That was the reality for Beatrice de Rothschild, born in 1864 into the famous banking family. Aged 19, she married into the wealthy Ephrussi clan, increasing her spending power still further. 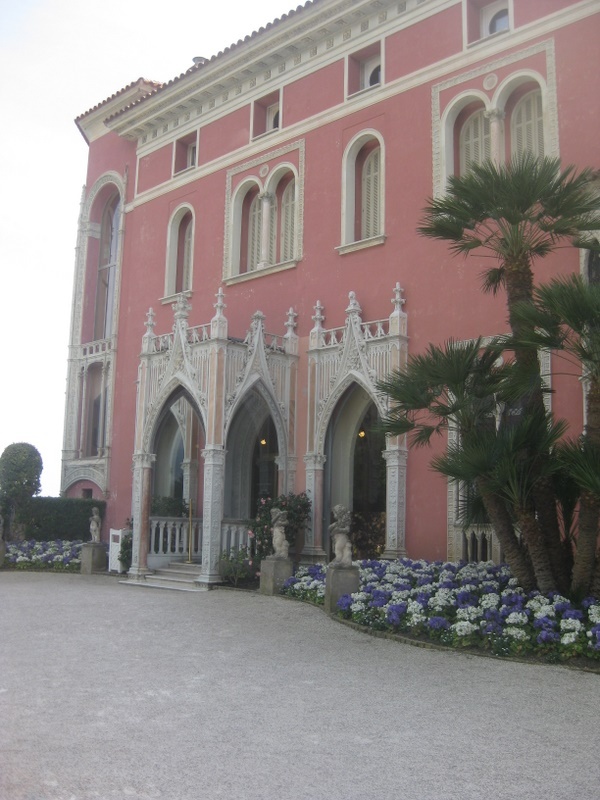 And to house all her loot, she built herself a pink palace at Cap Ferrat, one of the most beautiful headlands in France. It’s difficult to imagine that this was a scrubby wind-swept piece of land – now it has seven beautiful gardens – a Rose Garden, a Japanese Garden, a Spanish Garden and a Jardin Exotique with the most amazingly shaped and coloured species from all over the world. To the rear of the mansion is a formal garden where the fountains spring to life every 20 minutes with a water-ballet accompanied by lovely classical music. Eclectic is the only word to describe the villa’s contents – Beatrice collected medieval panels, Sevres and Meissen china, Fragonard paintings, oriental costumes, tapisseries – but somehow it works. The villa itself is very elegant with spacious rooms overlooking the sea on each side – and what breath-taking views. She was a demanding client, hiring and firing architects and designers but she did end up with a spectacular building. Oddly though she didn’t live there, preferring their house in Monte Carlo where she and Maurice spent much of their time gambling. The marriage was not happy – an infection from her husband rendered her infertile – and they separated when his gaming debts span out of control. 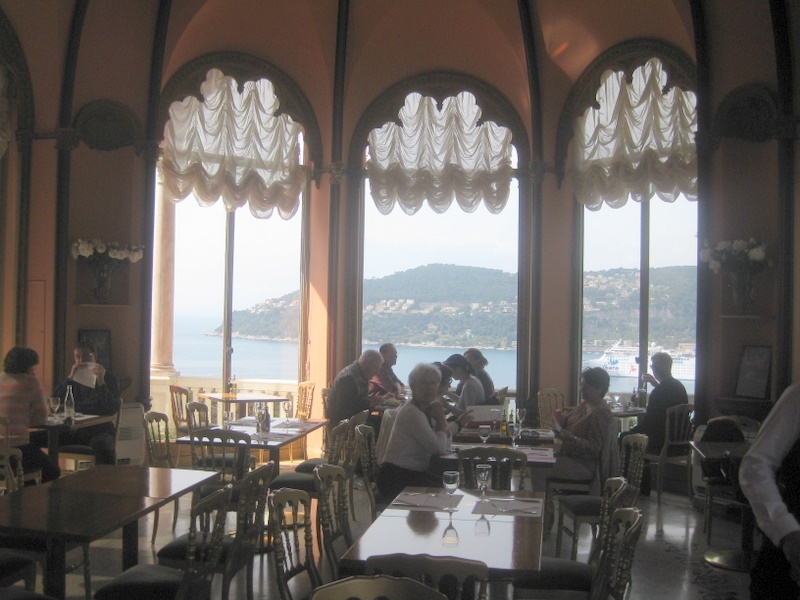 Eating: There is a wonderful tearoom-restaurant overlooking the Bay of Villefranche. You can either have a light lunch (quiches, salads) or a coffee and patisserie. It’s very very civilised! Driving from Aix: About 2 hours (this was in the week, off-season). 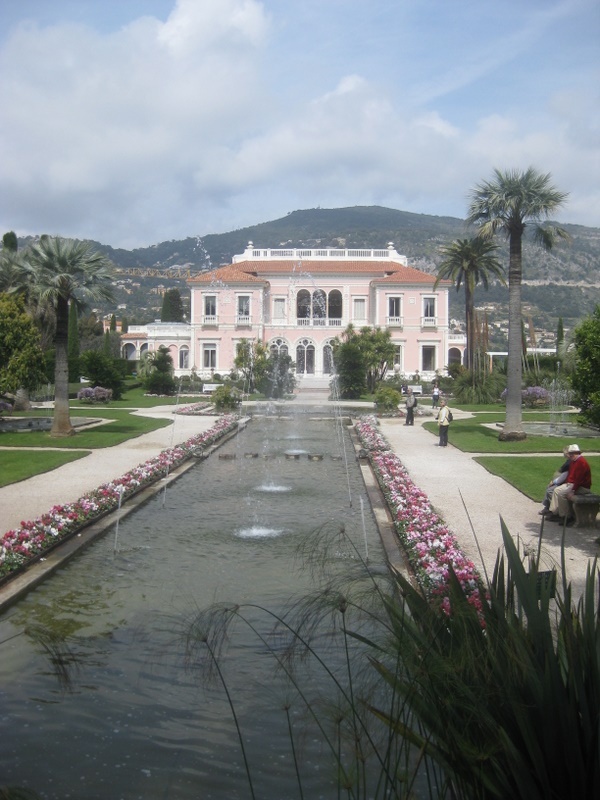 To get there, you probably have to drive through Nice and then through Villefranche. Can be clogged in the summer but at the moment fine. A fabulous and memorable day out. Finally got to visit the Fondation Monticelli which is on the coast, west of Marseille, between L’Estaque and Le Rove. And what a gallery it is! It started life as a fort, built in 1861 and standing high on the hillside to defend the coast. It fell into disrepair and was squatted and graffitied – until it was renovated and opened in 2010 as a home for a collection of paintings by Monticelli. He was a 19th century Marseille-born artist whose love of colour inspired Van Gogh. His paintings are on the ground floor of the gallery. 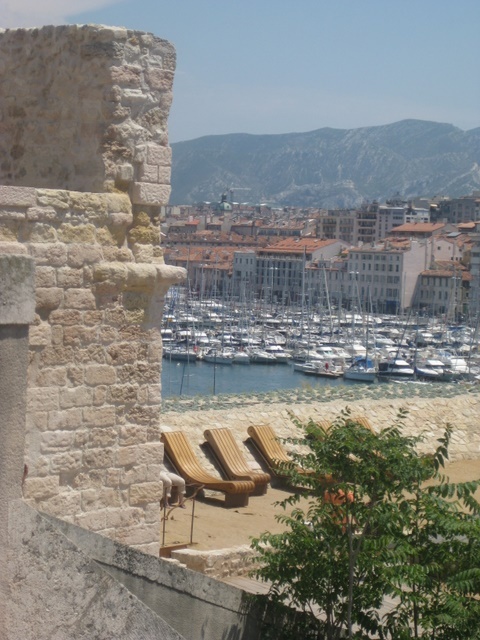 It was quite hard, though, to concentrate on the paintings with such amazing views through those beautiful arched windows: a sun-drenched panorama of Marseille, la Bonne Mère, the docks, massive white cruise ships, the yachts at L’Estaque…. Fondation Monticelli has a very large free car park from where it is a short walk to the gallery. It’s open Wed-Sun, 10-17:00hrs. L’Estaque is a short car-ride down the hill and has quite a few restaurants and cafés – especially good if you like local fish. There is a walking trail of panels linking the places artists chose to paint from. More info: http://www.marseille-tourisme.com/en/discover-marseille/city-of-art/lestaque-and-its-painters/ The panels show old photos of L’Estaque and the coast. It’s striking how much simpler the landscapes were then, with unobstructed views free of the clutter of cars, yachts, big trees, hoardings, parking signs, shops, dockland cranes. Thankfully plenty of painters recorded the coastline and village before modern life struck! Nearly had a Hollywood moment! If you haven’t been, the town stands on the neck of land between the Etang de Berre and the Mediterranean and is intersected by canals. The publicity calls it The Venice of Provence which is a bit of an exaggeration but it is charming with its colourful houses, beds of flowers and shrubs, and brightly painted boats. 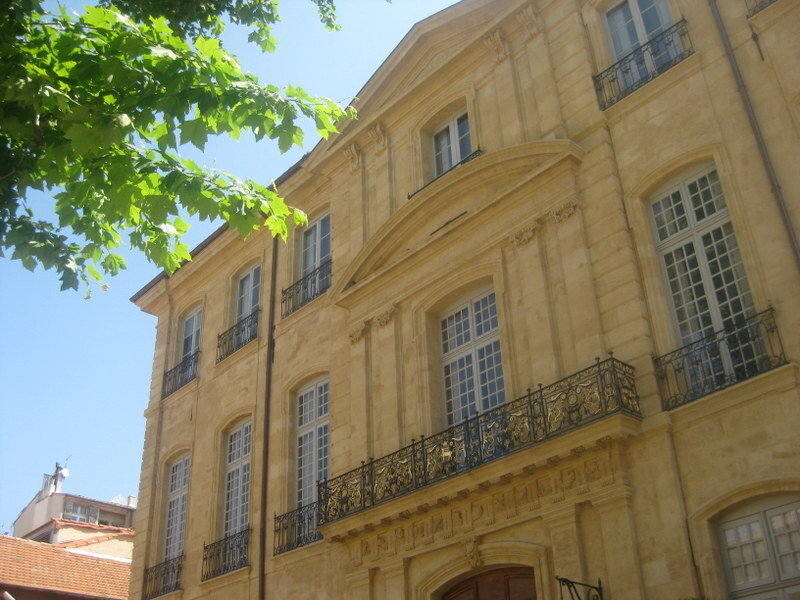 It was popular with painters and the Musée Ziem has regular exhibitions with local themes. The Musée Ziem also has a collection of pots and mosaics excavated locally – Martigues was originally ‘Maritima’ , a Gallo-Roman settlement dating from 5th century BC. In fact there is a rather interesting ‘Vitrine Archaeologique’ in the town – Place Maritima is a modern housing development but while building it, an ancient settlement was discovered. Ten years of careful excavation took place to uncover the ancient foundations and reconstruct the homes. 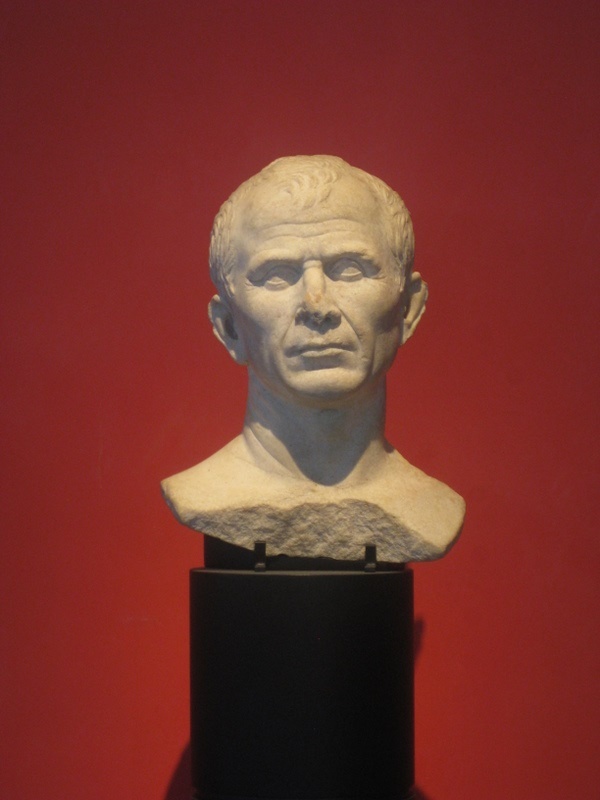 So today we can peep into the past through a large window – see details here: http://www.zevisit.com/tourisme/martigues/vitrine-archeologique. Martigues does seem to be blossoming. Culture Minister Aurelie Filippetti granted the town the title of ‘Ville d’Art et d’Histoire’. Apart from the honour etc, this means that there will be a small team focusing on the town’s development and they will get some technical and financial support from the State. The tourist office website will keep you informed on events. 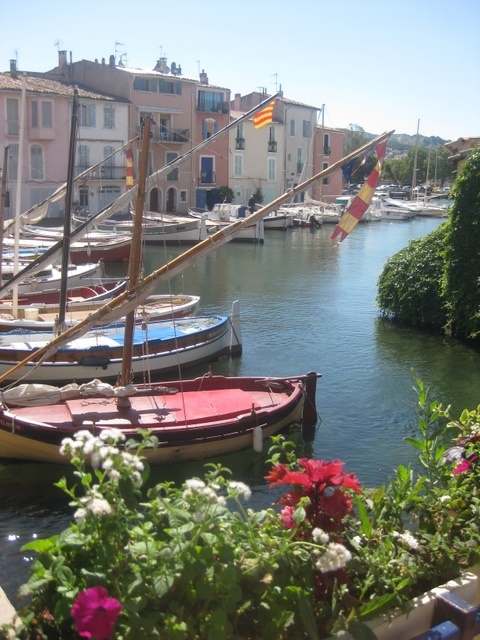 In June for instance they hold ‘La Fete de la Mer a Martigues’ with traditional boat races on the island. And the town is still a magnet for artists and photographers. At Le Quai des Artistes, there are painters’ exhibitions on summer Saturdays. So, I would say it’s quite a hike from Aix, but in conjunction with other events happening in town, or a nice lunch by the water, or an evening Sardinade, it makes for a very happy day out. What an amazing leap of imagination it was for whoever had the brilliant idea of using this abandoned quarry for a son-et-lumière show! It’s been running for years and the annual themes have been as disparate as Venice, Cézanne and Australia, all illustrated with massively projected images and accompanying music. Last year it was taken over by Culturespaces and some improvements to the layout have been made – a much smoother floor for instance which is easier when wandering around in the dark. I also like the new viewing galleries. However, most of us visiting yesterday felt that, in this year’s show, something had been lost, especially in colour quality. But this is such a unique experience that it is worth visiting. Details on www.carrieres-lumieres.com. 8€.50. Wrap up warm! Afterwards you can visit the little town of Les Baux where there are many restaurants. 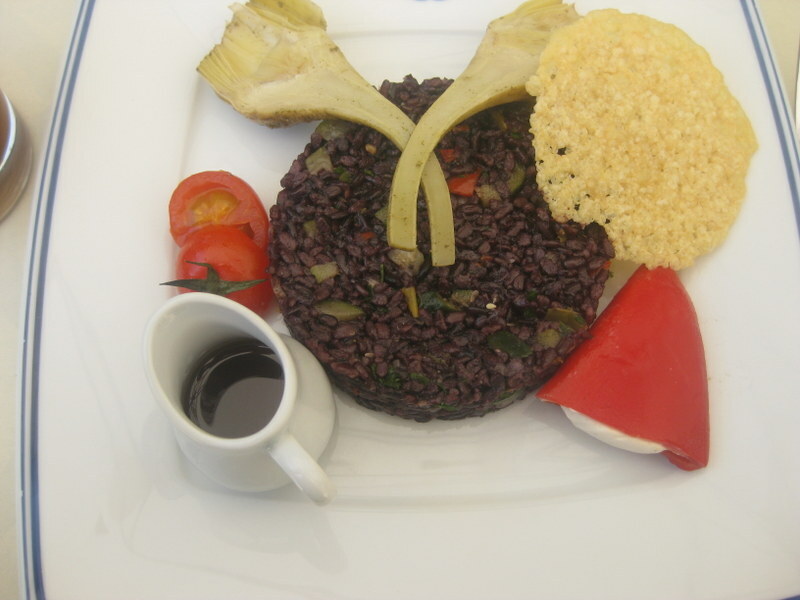 But we drove to nearby Fontvieille to have lunch at La Cuisine au Planet. It’s tucked away on a side street off a side street, but worth seeking out for the friendly ambiance, the food, and specifically their crême brulée à la lavande. I had eaten this 6 years ago at this restaurant and never forgotten how good it was! Luckily it was on the menu yesterday and was just as I remembered – delicious. 144 Grand Rue, Fontvieille, tel:04 90 54 63 97. We locals have been watching the ongoing work on the 300 year old mansion, the Hotel Caumont, for two years now as workmen repaired the roof, stonemasons worked on the ancient façade, and lorries drove in and out of what would be the garden area. Twenty million euros later, all has been revealed and what an elegant renovation it is. The ground floor is taken up with a large shop and a café and restaurant spilling out into the garden. Upstairs, there are two floors with galleries, for their major exhibitions. You can eat or have a coffee without paying to see the exhibitions. You have to go to the ticket desk at the entrance and ask for an annual Café Pass. This costs 12 euros…and it acts like having a private club in town…great loos! and carefully presented rather than being filling. About 16-18€. The desserts are patisseries served from a counter inside – what a choice! They obviously have a very good patisserie chef. They offer a child’s menu for 9€ which is good but it does seem a rather formal setting for little ones – for instance, polite notices tell you to keep off the grass. The lower garden is stunning with a typically Provencal fountain against the far wall, lines of perfectly tailored trees and huge pots of white flowers. I’m not normally into formal French gardens, my English soul preferring our blossoming billowing herbaceous borders, but the Hotel Caumont garden is simply lovely. You can read here http://www.caumont-centredart.com/fr/decouvrir/restauration-lhotel-caumont/restauration-jardins how they found landscape architect Robert de Cotte’s original plans in the archives and how they adapted them. We were expecting lots of people today as it has only recently opened plus it is ‘la Fete des Meres’, but at mid-day we got a good table in the shade with no trouble. What a wonderful experience and a big plus for Aix. Chapeau to Culturespaces! Yesterday I visited the new MUCEM building along with the renovated Fort St Jean and came away hugely impressed with the whole complex: firstly, what a site! Both buildings afford panoramic views across the city, the harbour, the open sea and the docks. This alone is thrilling. Yesterday there was a regatta which filled the bay with white sails skittering across the water whilst alongside MUCEM were tethered a French war-ship and a huge car-ferry which set off to Algeria. The area around both buildings has been paved to provide a big esplanade for visitors. It’s hard to remember what a sad, neglected, dusty corner this used to be. Secondly, I loved the way it is all connected by concrete passerelles allowing visitors to walk easily between the two buildings and then walk across to get instant access to the Panier. Then the design of MUCEM is beautiful. 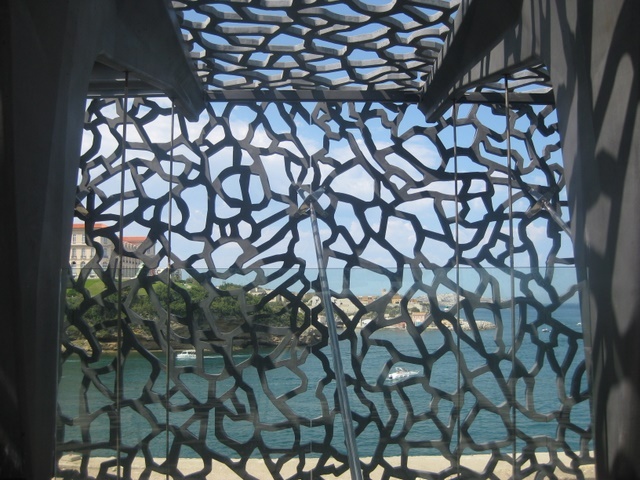 The black concrete lace wrapping cast amazing shadows across the terraces and reframed the seascapes to dramatic effect. It all felt very mysterious and oriental, but apparently Rudi Ricciotti claims that he was inspired by ‘the rocky bottom of the ocean lifted up’. Visitors move from floor to floor down ramps which wind around the building, again giving superb views. And the final impressive feature was the attention to detail throughout. OK it cost 191m€, so that is what you should expect, but the finishing touches are well thought-through and high-quality. The top terrace for instance has a long line of black mesh chaise-longues for visitors to stretch out and enjoy the views. On the terrace of the Fort St Jean, again there were wooden loungers available (see photo to the left). The planting and paving there is lovely. The MUCEM bookshop has a long ledge with lots of cushions for people who want to look at the books (all very tempting)…and so on. Catering is by Gérard Passedat of Le Petit Nice – both at the top-level restaurant and the café. And if they are busy, it’s easy to nip over into the Panier for a light lunch in the Place de Lenche. You don’t have to pay for any of this. You do however have to get a ticket if you want to go to the permanent collection or the temporary exhibits. The permanent collection is an odd amalgam of stuff with a Mediterranean theme, some of it quite interesting – I’ve never seen a guillotine before. A couple of gripes. The internal layout is messy. It’s easy enough coming down all the ramps but if you want to get back up to the terrace, the stairs/lifts/escalators are all over the place. And secondly, this museum has had so much publicity, drumming up visitors from afar, wouldn’t you think they would have more than 2 people selling tickets at MUCEM and 2 at Fort St Jean? I think long queues are unacceptable when there is so much unemployment! In October 2013, the Roman boat which had been on the bed of the Rhone for nearly 2000 years was finally unveiled in Arles; it’s all pieced back together, carefully preserved with resin, and quite magnificent. The 31m boat had been sailing down the river with a cargo of 27 tonnes of stone when it sunk in a flood. And there it remained, undisturbed at 9m deep, until it was discovered in 2004 by diver-archaeologists, looking for amphorae and the like. A film shows visitors the conditions that these divers were working under – the Rhone is deep and very murky so they were literally feeling their way along the river-bed with special spot-lights on their helmets. Imagine then, having located this sunked vessel, having to saw the timbers to retrieve them as well as marking the position of each component, all the while underwater. They then had to raise each piece to the surface where a team was waiting to seize the wood and begin treatment before it began to deteriorate in the air. A lab in Grenoble played a vital role in the process using resin to preserve the wood and replacing the 1700 iron nails that were unsaveable. This is a story of remarkable skills and teamwork. In the meantime, a new wing was being constructed at the Musée Départementale Arles Antique for the boat, which is now on show right next to the river where it sank! Apparently the boat is one of very few, worldwide, in such a state of preservation. Certainly it is much more whole than the ones in Marseille which have also just been exhibited. The ‘Arles Rhone 3’ is 90% original – the decision to fill in the gaps with modern materials and replace the nails was taken at the very highest echelons of the French archaeological service and done to give visitors a clear vision of the original. It is now classified as a ‘tresor national’. Much work has also gone into restoring and exhibiting the items found in and alongside the boat – ceramics, oil lamps, statuary – and of course many amphorae which were thrown away once emptied. The whole museum is fascinating and I especially like the models which show us what Arles looked like and indeed the massive circus for chariot-racing right where the museum now stands. I wonder what the Rhone will give up next? The Musee Departemental Arles Antique is open Daily 10-18:00 exc Tuesdays. Details on www.arles-antique.cg13.fr which is an extremely good and informative website. The museum is outside the town and easy to find. Lots of parking….but no café. If the Metéo is favourable and there are some sunny days ahead, perhaps it’s time to visit the beach? Much as I like the Calanques, I do love a long stretch of sand and an esplanade for a good healthy walk. 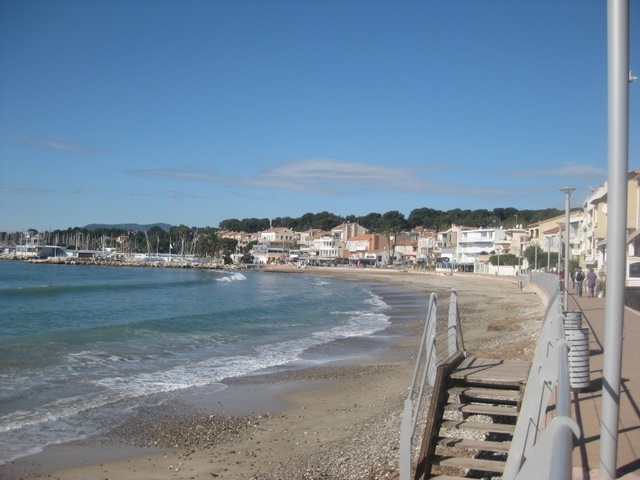 So this February, we headed off to Fréjus plage which is just over an hour’s drive from Aix. We swapped sun in Aix for a chilly wind down on the exposed coast; but we wrapped up, had a bracing walk along to St Raphael and then dived into a restaurant for lunch. Les Sablettes is a restaurant/pizzeria ‘les pieds dans l’eau’ – I do love this French expression! For a day outside school holidays and on a weekday too, it filled up very quickly, especially the cosy inside room which seats a lot of people. But we were happy out on the terrace where we had beautiful views – but we didn’t stick our pieds dans l’eau! Afterwards we made a good find – the little Plage de la Galiote at nearby St Aygulf. It’s tucked away on the other side of the bay from Frejus/St Rapahel so you get nice views of the Esterel mountains and you are protected from the wind. Result! Scarves and fleeces off, we enjoyed coffees and ice-creams at one of the 6 little cafes that are advertised as being les pieds dans le sable! (Right) This is the view from our table and (above) here are the cafés which line the sands. It’s ideal for families who want to eat simply while their children play on the beach or in the shallow waters. However – and this is a big ‘but’ – I wouldn’t attempt this on warm weekends or in the school holidays. The whole area is frenetically busy with traffic, people, camp-sites, large chain shops. It’s quite incredible that St Raphael just one hundred years ago was a tiny fishing village – F. Scott Fitzgerald fell in love with it while he was living there, working on ‘The Great Gatsby’. Goodness knows what he would think of the acres of concrete, boxy apartment blocks and tourist shops that are there now. But you can find little corners of peace where you can admire the beauty of the coast and, les pieds dans le sable, gather shells and happy memories for another day. This week we visited the first museum to be dedicated to Pierre Bonnard which opened this summer (2011) in Le Cannet which is where he spent the last 20 years of his life. The opening exhibition was ‘Bonnard et Le Cannet: dans la Lumière de la Méditerranée’ which focused on the local landscapes – the deep blue sea, the bright yellow mimosa, the blossom and the vivid greenery that surrounded his villa. To complement your visit, the museum provides a Promenade Culturelle leaflet which takes you up into the old town in the painter’s footsteps. There are panels at key places where you see the view, plus his interpretation of it. It’s a lovely day out. It takes about 1hr 45 mins to drive from Aix and the museum isn’t far from the A8. 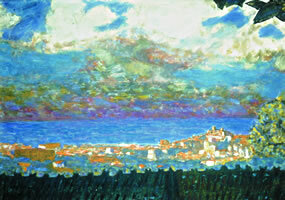 Details on http://www.museebonnard.fr. Driving into a Provençal vineyard, the last thing you expect to see, surely, is a superb Louise Bourgeois spider sitting in the middle of an enormous plane of water, reflecting the surrounding hills and vineyards. It is a stunning setting for the sculpture and is in fact the beginning of an art trail that takes the visitor around the 600 acre site. The walk starts at the sleek visitors’ centre designed by Tadao Ando. Map in hand you head off up into the hills passing neat rows of Grenache Noir and Syrah vines. Various art installations can be seen on the way up but the best is right at the top where an ancient chapel has been renovated by Ando and enclosed in a wooden and glass building. It’s a beautiful and peaceful spot with views of the shining white summit of Mont Ventoux and the snow-covered Alps. Down through the vines, you come to ‘Drop’ by Tom Shannon, a mirrored installation which reflects the trees that surround it. And finally, there is the Music Pavillion. Designed by Frank Gehry of Guggenheim Bilbao fame, it is a beautifully deconstructed building with tumbling wooden beams and angled glass – it must look wonderful during evening concerts. This is an extraordinary venture by the Irish businessman who owns the vineyard. What a brave and beautiful mixture of art and wine! DETAILS: Find Chateau La Coste on the road from Aix to le Puy-Sainte-Réparade – it’s well sign-posted. It is open every day 10:00-19:00. There are various tours of the art and also the wine-making operation – details on www.chateau-la-coste.com. The mainly Irish staff are friendly and informative; plus the visitors’ centre has a restaurant where food is locally-sourced and made on site. It must have been so exciting in 1967 when, excavating the site for the new centre commercial at the Bourse, they started turning up all manner of Greek and Roman remains, including large pieces of boats. The site was on the creek which came up from today’s Vieux Port and, in Antiquity, had been lined with warehouses, boatyards and workshops. Some of the foundations and walls have, since then, been on view in the Jardin de Vestiges next to the centre commercial and a small museum displayed some of the finds. But it was only attracting 35,000 visitors a year and could have closed down. But, thanks to 34m€ of funding from MP2013, the whole area has had a major overhaul and last week reopened as France’s largest history museum and one of the largest in Europe. The new Musée d’Histoire de Marseille is fascinating. 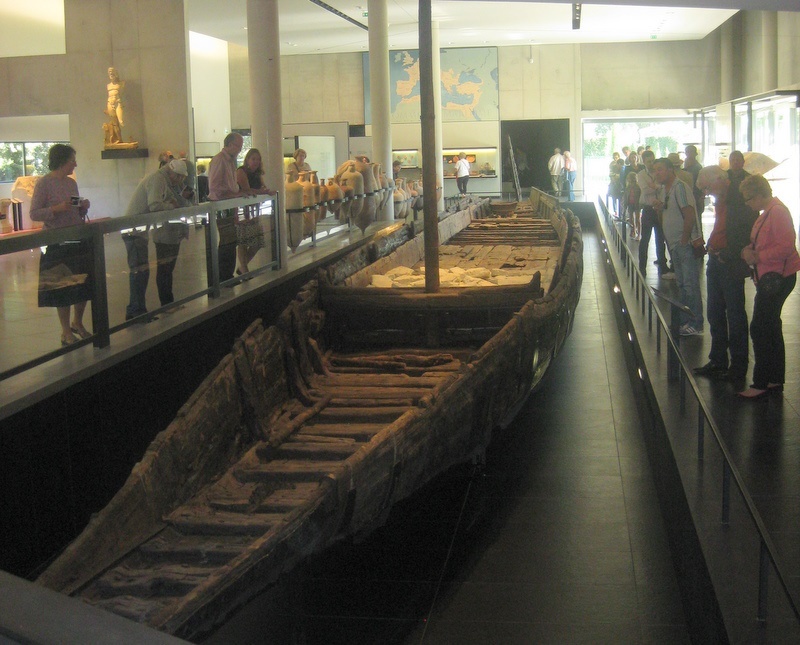 It has two Greek and four Roman boats on show – they had previously been in store through lack of space. ‘Boats’ is being rather kind. They are actually lots of planks of wood but models show us what they would have looked like: anyway it is impressive to be able to see these remnants of ships that busily carried raw materials into Marseille and crossed the seas with their exports. The Greek remains date from the 6th century BC: incredible. Nearby amphorae would have been filled with oil and wine and there are cases of pottery and glass that the early inhabitants of Marseille would have had on their tables. The museum is divided into 13 sections, taking us through 2,600 years of history. There are maps, large-scale models to show us what the town would have looked like, and 3D animations of human guides. Death was kept firmly outside the walls of the settlement. The museum has several tombs with their original inhabitants on view, and very sadly the remains of tiny children, often interred in amphorae. Christianity came early to Marseille which was growing in importance as a busy port. Even the fall of the Roman Empire and the arrival of the Visigoths did little to impede its growth. Trading took place far around the Mediterranean and the town was later involved in the Crusades. 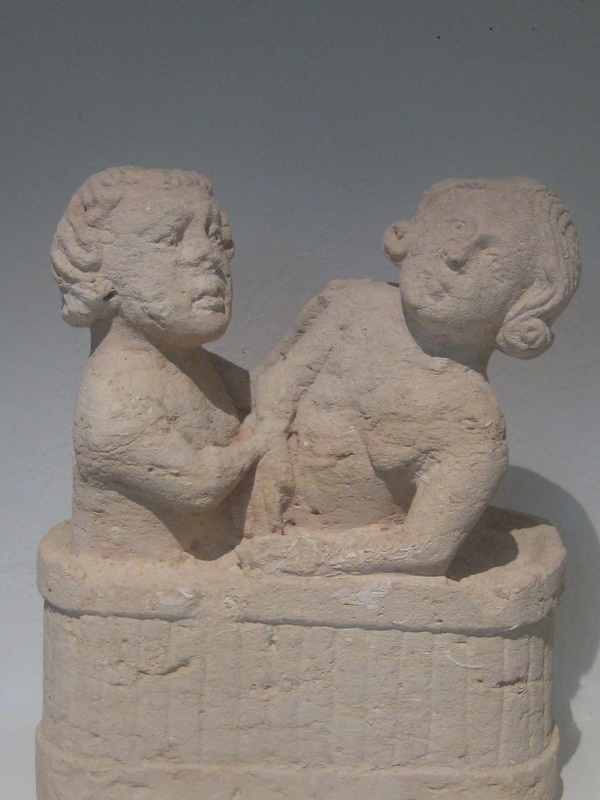 One unexpected item from daily life in the 13th century is the statue of these two fellows, an early advertisement outside one of the many bathing houses which were also ‘lieus de tolerance’. Explanatory placards for exhibits are in French, but the beginning of each of the 13 themed sections has a version in English. You can also get a comprehensive book in English with your ticket. I hadn’t really thought about this but in fact there is nothing much left of antique or medieval Marseille except for the Abbaye St-Victor. With so much activity being based around the Vieux Port, buildings including churches were repeatedly demolished and replaced. So it is so valuable to have these exhibits with supporting materials in the new museum. It wasn’t until the arrival of the Louis XIV the Sun King in 1660 that buildings went up that we can still see today – fort St Nicolas and fort St Jean were constructed with cannons to protect the port but also turned to the city to quell any rebellious instincts. The Hotel de Ville was built on the quay and, in the Panier, the Charité to house the poor. The museum has details on this period of construction. But still 350 years to go…..I read that there are 4000 objects on view in the galleries and by this point it certainly felt like it! 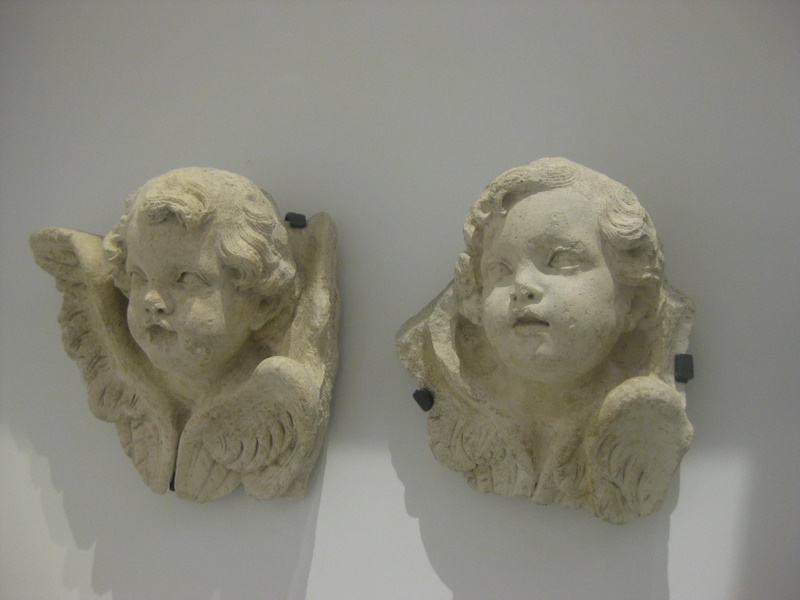 These cherubs, along with some beautiful statues and sculptures, were in the Church of St Martin. One of the city’s oldest churches, it had been rebuilt in the 12th century in Gothic style…but astonishingly was demolished in 1884 to build rue Colbert. How lucky we are that at least these works were kept and are now on display. The collection finally comes up to date with posters, films and ephemera embracing the transbordeur bridge, the Occupation, Pagnol, the role of women in 20th century, soap production, the importance of shipping… After two hours of local history, exhaustion was setting in, mentally and physically too. I shot through the 20th century at a gallop. But it really is a wonderful museum which carefully illustrates the metamorphosis of this fascinating city. 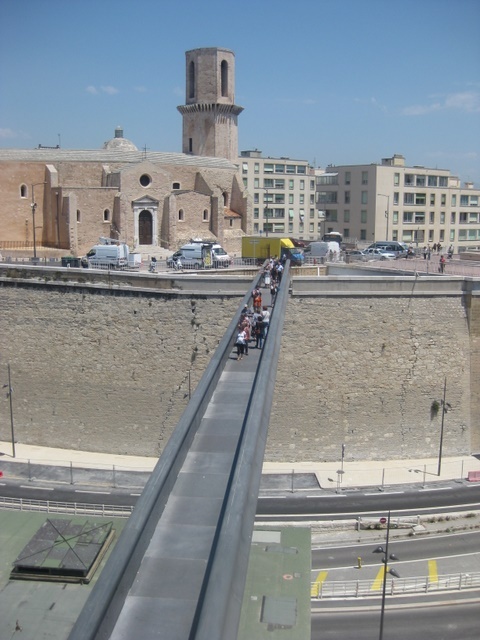 The architect Roland Carta also worked on MUCEM which, as he points out, is at the other end of the old Roman road that now links these two modern buildings. In an interview he said that working in the basement area of the centre commercial was a big challenge as there were constraints in ceiling heights, space and light – and the great number of objects to be displayed. They have done a magnificent job. I will certainly revisit it and concentrate on different sections. I think children would love it too – and they are well catered for with cool little play areas where they can either colour or play Roman games or stamp patterns. There is also a well-stocked book shop with a good range of Provencal souvenirs. It’s open 10-18:00hrs Tuesday-Saturday and costs just 5€. You can either exit through the jardin de Vestiges and walk in the steps of the first inhabitants of Marseille or just step into the Bourse shopping centre to sample some of Marseille’s 21st century trading activities – and a well-deserved coffee. Highly recommended. I loved the films Le Château de Ma Mère and La Gloire de Mon Père based on the novels by Marcel Pagnol, so have long wanted to visit the eponymous château. 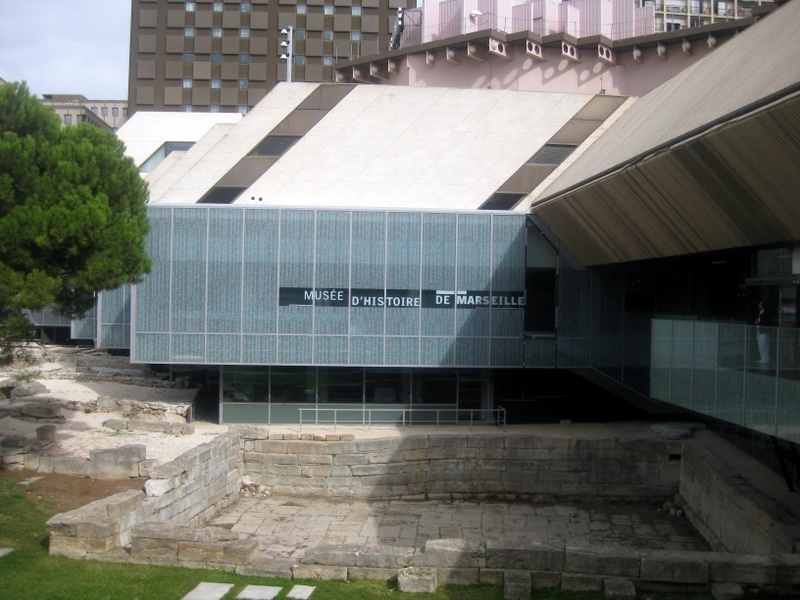 Situated in the 11ème arrondissement of Marseille, it has been taken over by the town to be a centre for cinema – la Maison des Cinématographies de la Méditerranée. Films in VO are shown 2-3 times a week, often in the form of a Ciné-Brunch or an Apéro-Château to take advantage of the onsite restaurant. Inside there are expos and outside a 4000m2 garden to stroll in. But I had a disappointing experience! Firstly we couldn’t figure out how to get in – the entrance is completely hidden without signs. Then we found precious little to see inside. The building has little of the original interior left: once the Pagnol family sold it, it was occupied by French soldiers, German sailors, Spanish squatters and then a property developer who stripped out what was left. The photo-expo on the calanques was OK and there is a permanent display of Mediterranean film-clips in a 45-minute circuit of booths costing 7,50€ – and that’s it. No information on the building (I gleaned the stuff above from a panel in the car-park) and nothing on Pagnol, his life, his books, his films. No workshops for children. Worst of all for an English visitor, not even a cup of tea! The restaurant was firmly shut. There was hardly anyone there, just a couple of families wandering aimlessly around. What a shame. With a bit of imagination this could be a wonderful arts centre and memorial for Pagnol. Info on www.chateaudelabuzine.com where, “there are no translations available”! ITER – which means ‘the way’ if you are a Latin scholar or International Thermonuclear Experimental Reactor if you aren’t – is an international nuclear fusion research and engineering project, which is currently building the world’s largest and most advanced experimental tokamak nuclear fusion reactor at Cadarache just north of Pertuis. We visited today, a treat for M. Aixcentric, but to my surprise, I found it extremely interesting too. The guided tours take one hour – we were bused from the car-park into the complex where we saw the massive building site and then went to the visitors’ centre to learn about what is happening there. The fusion reactor itself will produce 500 megawatts of output power for 50 megawatts of input power, or ten times the amount of energy put in. The core will heat up to 150m degrees, ten times hotter than the sun. Huge magnets around the reactor will confine the reaction and nearby they are constructing big pools to cool the water before it is released. I was fascinated by the logistics of the operation. All the partners (China, Japan, S Korea, Europe, the US and Russia) are supplying components which arrive in France at Fos. From there they are taken by barge across the Etang de Berre and then by overnight convoys travelling at 5 kph. A sort of driver-less 52-axel truck will be used, and to smooth its way, bridges are being built alongside existing ones, roads are being widened, power-lines are being buried and round-abouts flattened. We learned so much about the reactor, the numbers of people being employed, the international school created for their families, their work to preserve the local bio-diversity, their precautions against earthquakes – our guide was really excellent. I can only suggest you try a tour yourself! They take place Mon-Fri – email visit@iter.org. 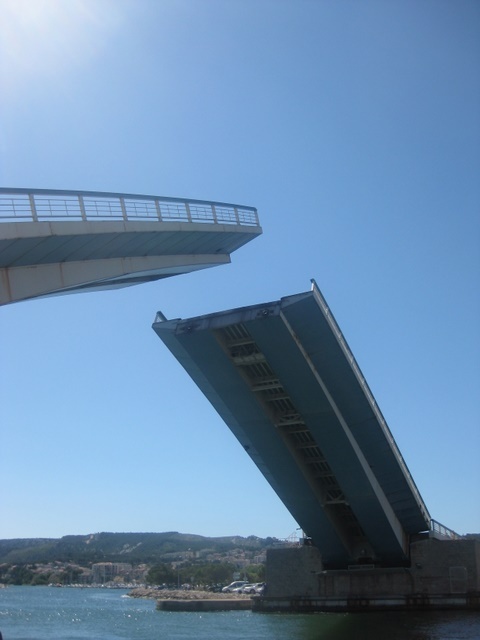 Alternatively have a look at their website www.iter.org which has lots of info and video clips of their progress. We visited this resort as the rich and the famous of the film industry gathered in Hollywood for the Oscar ceremony and wondered how many of them would recognise this dusty little building on the sea-front at La Ciotat? Incredibly it’s the world’s oldest cinema. When the lights first went down on the evening of 21st March 1899 at the Eden cinema, la Ciotat locals enjoyed the the world’s first public film show in a cinema. 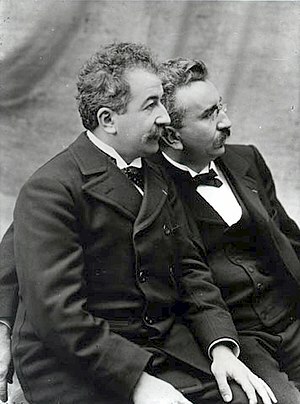 It was organised by the wealthy Lumière Brothers – Auguste and Louis – whose father had a photographic factory in Lyon. The brothers’ first film was of the workers leaving the factory – under one minute of footage, and shown in a café in Paris in 1895. The family had moved to live in La Ciotat at the Chateau du Close des Plages, a sumptuous house with90 hectares of land next to the sea. We had just had lunch in a backsteet café in the town and watched a young couple spooning food into their little one. Over one hundred years later, some family basics haven’t changed at all. The Eden was rescued from squatters, then developers who wanted to build flats, 30 years ago. Now it is listed as a historic building and is being restored as part of the MP2013 Year of Culture programme. Most Luberon villages are worth a visit but Ansouis is easiest for us to reach from Aix. Not only is it very pretty – it’s one of ‘Les Plus Beaux Villages de France‘, (there are strict entry criteria for this listing) – but there are three interesting things to do while you are there. The château which has just re-opened for the season has an unusual heritage in that it was owned by the same family – the Sabrans – for over 900 years. That all changed in 2008 when one of the descendants decided, against the wishes of her brothers, to sell it. Bidding against couturier Pierre Cardin, in an auction a la bougie, the château was snapped up by a couple from Aix for 5,6m euros. It’s said that they are passionate about history and have been busy refurbishing it. The core building is a military fortress but a residential wing was added in the 17th century. There are dungeons and weapons in the medieval part, a lovely Provençal kitchen and pretty bedrooms. This snoozing lion is missing some great views over the lovely countryside. It’s open every day except Tuesdays; entry is for organised tours at 14.30, 15.30 and 16.30. The chapel which used to be a guard-room is nearby and can be visited free of charge. Back to the car for a very short trip to a nearby vineyard: Château St Esteve-de-Neri. They have excellent wines – lots of medals and awards – and you can taste them Mon-Sat, 10-12, 14-18hrs. The enthusiastic owners are British and, unusually, have their wine deposited in London so can deliver cases across the UK. They ask visitors to ring the bell if they aren’t there as they will probably be in the garden! Wine in the boot, set off for the final treat of the afternoon – and what a treat this is! L’Art Glacier is a restaurant with a difference as it is dedicated to ice-cream. It’s off the road towards La Tour d’Aigues and, as you drive up a lane through the woods, you could be forgiven for wondering whether there really is a restaurant in such a remote spot. But it is worth seeking out – from the tables on the terrace you have the most wonderful view of the Luberon to enjoy while perusing the menu. The Perrière family are maîtres glaciers and have 60-80 different flavours of ice-cream and sorbet to offer, beautifully presented and decorated with flowers. Warning – they are very very filling so go hungry! From April 11th, they will be open in the afternoons Wed-Sun. www.lartglacier.com for full details and directions. For all these visits, do please check out the websites before travelling. Parc de Baudouvin in La Valette du Var. This 18th century Provençal garden has terraces, ponds and vegetable gardens specialising in old local varieties. Planned by a landscape architect called Michel Racine, great name, it was awarded ‘Jardin Remarquable’ status in 2009. All sorts of events take place. Also ecological – they have ‘une Green Attitude’. They have 137 types of day butterflies and 320 night species, 10% of all the varieties in the world. To support the butterflies there are 500 different types of wild plants. In the hills above the town, there are great views and they provide tables for picnics. This park was left to the town and has developed into a botanical garden with exotic hothouse; apparently it’s a favourite for Sunday family walks as there are shaded walks plus a petit-train and carousel. They have animals (goats, monkeys, ponies) and lots of rare trees around a lovely lake. This is not so much a park as a natural coastal area which has been protected since 1989. It is full of Mediterranean species and vegetation and there are guided tours. Backed up against rocky cliffs, this has an amazing waterfall, caves, 19th century gardens – and it’s protected from the Mistral. They have just established a play park for the little ones. 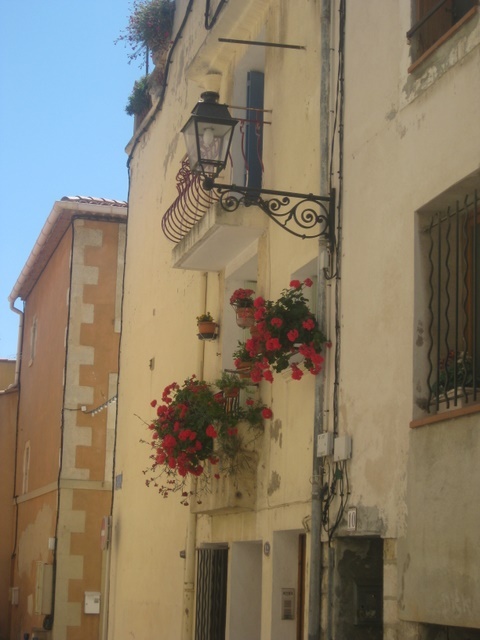 The nearby village was founded 2000 years ago and has narrow streets with arcaded buildings. Situated next to the papal palace, you can walk up through the gardens and fountains to admire the view of the Rhone, the famous bridge and the town itself. If the weather is clear, you should also be able to see Mont Ventoux and the Dentelles de Montmirail. The statue (right) is Venus who is in the middle of a small lake – there is a café there or space for picnics. Opposite the sea at the end of the Prado, this is a favourite for families. Another ‘Jardin Remarquable’ this has Chinese trees, Japanese features, plus lots of Mediterranean species. The original plane trees bordering the walkways were a casualty of WW2: American soldiers used the park to store munitions and the wooden cases harboured a killer mould. It’s now replanted with lime trees – adding to the total of 1000 trees in the park along with 4600 rose-bushes of 380 varieties. There are medicinal plants, an area for climbers plusa garden for 400 plants which live without watering. It’s a favourite spot for picnics and even sporting events. This is an oasis of Mediterranean planting between the massive cliffs and the sea. It was started in the nineteenth century with successive private owners developing the range of species. Today it is managed by the Bouches-du-Rhône council who have put up panels to describe the varieties of plants. Palm-trees, cacti and bamboos abound – all against a backdrop of Mediterranean blue. Indeed you can climb to the belvedere at 82m for stunning views of the coast. Full details – locations, opening times and entry fees where applicable – are all in ‘Jardins et Balcons’.